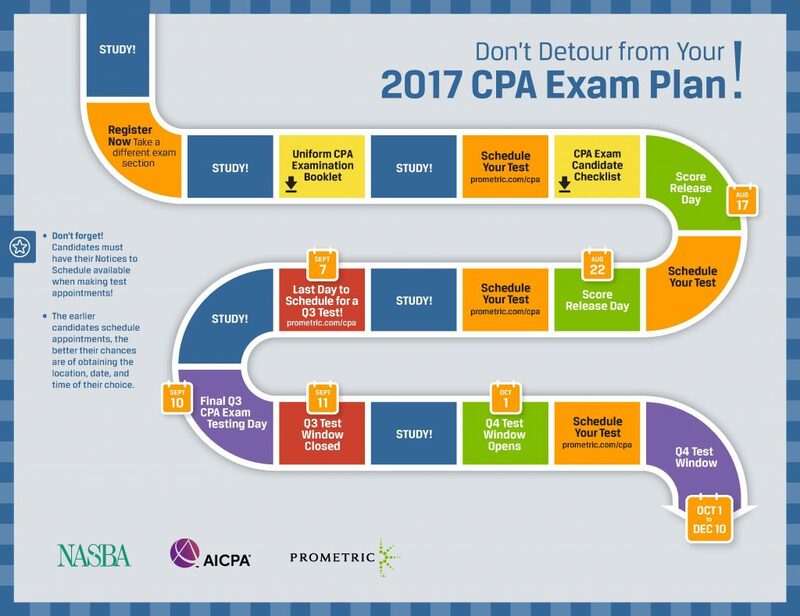 Don’t Detour from Your 2017 CPA Exam Plan! Despite the recent score release delay, NASBA, AICPA and Prometric encourages all CPA candidates to continue on their path to becoming a CPA. It is important to remember that NASBA does not create or score Exam content (AICPA does). However, NASBA is here to assist you with preparing for the Exam itself and will be here for you every step of the way following the Exam. For now, candidates can reduce the stresses of testing by scheduling early and choosing off-peak days (Tuesday, Wednesday or Thursday). All candidates are urged to schedule their next Exam section as soon as possible. Check out the below infographic to better understand the 2017 CPA Exam Plan, including testing windows, important steps and more! Have further questions? Review NASBA’s CPA Candidate Bulletin or Exam Resources page.